The Phone Photography Class. Self-paced! Hello again! Lawn Fawn is posting all the winners of their most recent giveaway. Don't forget to drop by the blog to see if it's you! Here's another layout I created using some of the new goodies. The background paper is this year's version of my favorite bokeh paper ever (from last year's holiday collection, see it here.) The alpha is Milo's ABCs. 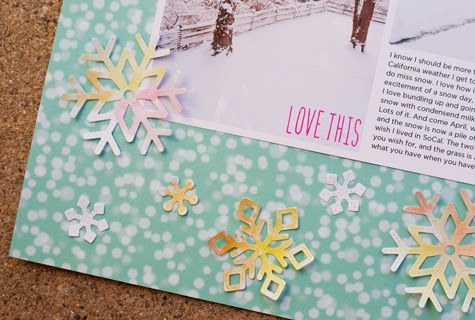 And the snow flakes are the super cute Stitched Snowflakes. I cut a bunch of Stitched Snowflakes, and then applied some watercolor randomly. I stuck to a yellow/orange/pink palette to bring some contrast to the teal-ish background. Even if my kids made comments about yellow snow… Boys. Sigh. Thanks so much for coming by. My kids have today and tomorrow off (Rosh Hashanah). I'm hoping to get some hiking time with them and some crafting time by myself. Hope you have a great week (and weekend). It's time for another Lawn Fawn Inspiration Week! And this time, Lawn Fawn is featuring its holiday line, Snow Day. I know right? Christmas! Snow! Eeep! Not sure I'm entirely ready for this. Especially since the temps around Los Angeles have been in the 100s. I created this layout about one of our Christmas trees. Back when we lived in Philly, one of our favorite traditions was to drive out into the country to find that perfect tree, cut it down ourselves, and haul it home. We've done it once here, and the experience was a bit surreal. There we were, cutting down a pine, surrounded by palm trees. PALM TREES! And we were all in shorts and T-shirts. SHORTS! But it's not going to stop us from doing it again this year. 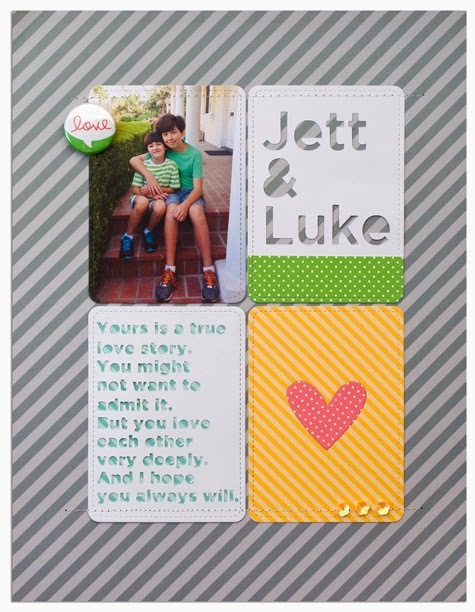 To create this layout, I used the Hoodie paper, which is all journaling cards on one side and tiny polka dots on the other. I printed photos in 3x4 and one in 4x6. 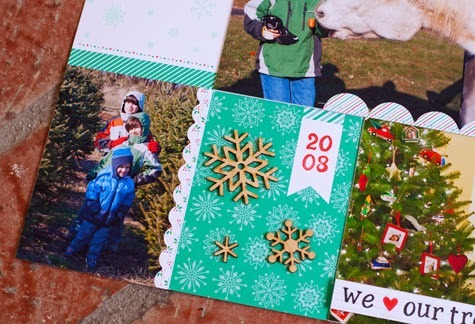 Each photo has a little paper detail that I punched out (Fiskars punch) from the Snow Day petite paper pack. I sewed the scallops directly onto the photos. 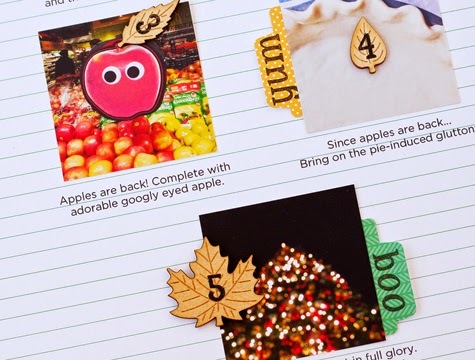 Then adhered them right on top of the journaling cards using pop-up dots (Scrapbook Adhesives). The alpha stamps are Riley's ABC. The tiny snowflakes stamped on the "Jolly Holly Days" card are from Deck The Halls set. 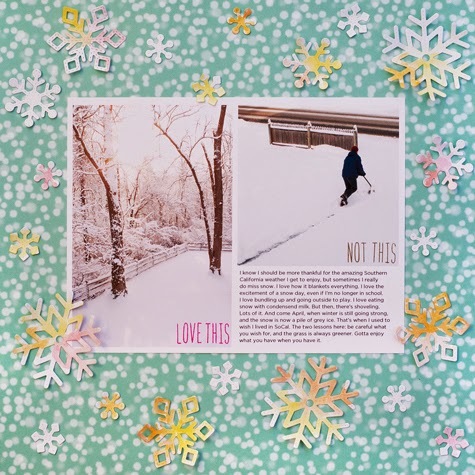 I finished off with my printed journaling, and wooden snowflakes. Easy peasy. Thanks for dropping by! Don't forget to visit Lawn Fawn's blog, and leave a comment to win. See you again tomorrow. Hey there! Lawn Fawn is having it's Fall/Winter Release Week, and if you haven't visited their blog during a Release Week, you must. 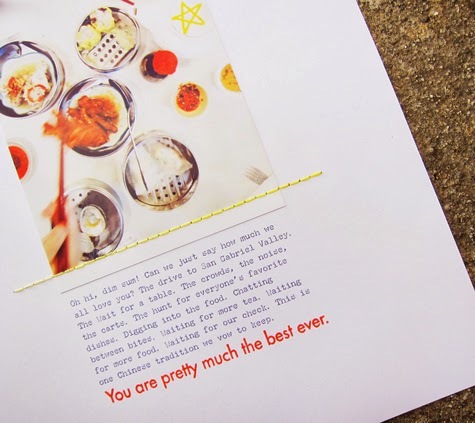 It's filled with great cards, layouts, ideas, and the best: giveaways! Here are two of my projects for this week. The first one featuring Monster Mash. It's so stinking cute. When I first saw it, I was reminded of my youngest in the Charlie Brown Halloween Ghost costume I made for my middlest. I love it when my kids want to "recycle" old costumes. 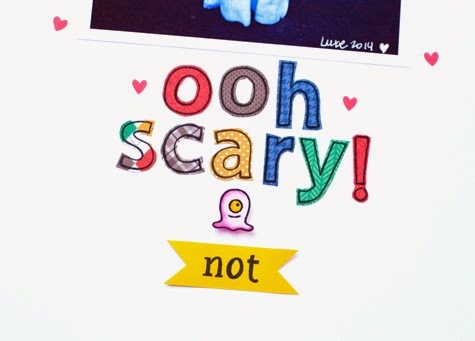 I made the title using Quinn's ABCs (which has matching dies) and Riley's ABCs ("not"). The ghosts/monsters also have coordinating dies. 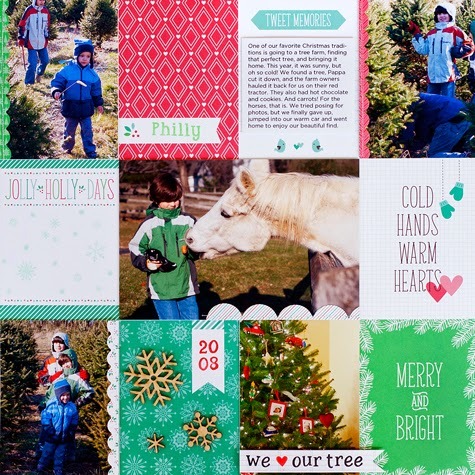 This second layout features the new Sweater Weather paper and embellishment collection. It's browns, yellow, greens, reds, oranges, and blues. And those cute wood veneer leaves. They stamp really well with StazOn. The title is Cole's ABCs dies, and the numbers and words are Riley's ABCs. Can you tell I miss a proper Autumn? I know I'm lucky to live in the land of eternal sunshine, but as crazy as it sounds, I sometimes wish for a brisk day. You know, the grass is always greener and all that. 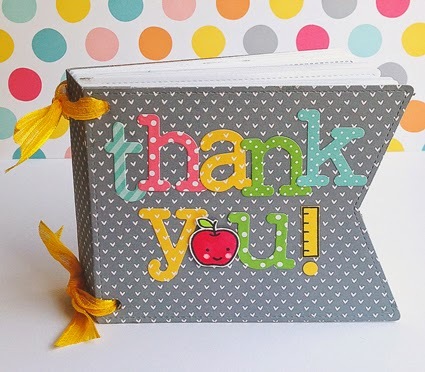 Thanks for coming by, and don't forget to visit Lawn Fawn's blog and comment each day for a chance to win all the new goodies! And I love how this page turned out. For more info, go here (Technique Tuesday's blog). Hello hello! It's the end of the school year. That means, it's time for teachers' gifts! Two words that kind of scare me. I'm usually a "cash and card" person. But since I'm room parent this year, I had to step up my present giving! 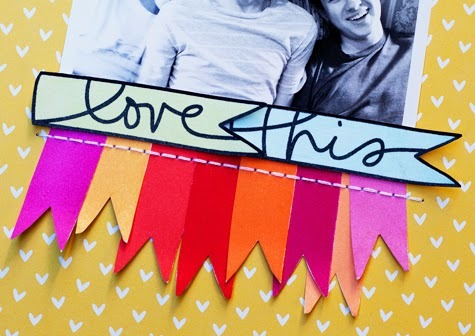 Enter this mini-album I made using Lawn Fawn's Stitched Party Banners. Super duper easy! 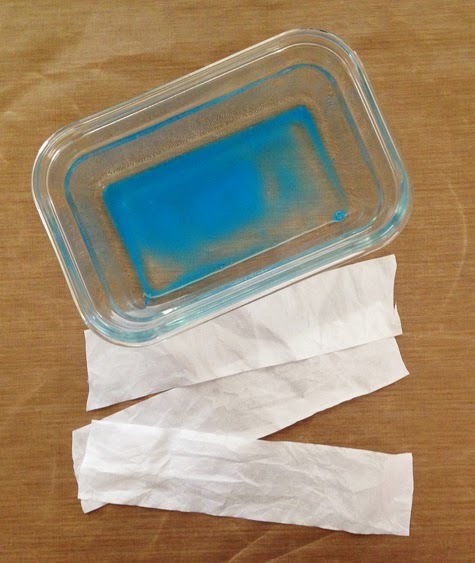 For step-by-step instructions, please visit the Lawn Fawn's blog. Thank for dropping by! I'm so excited to share these projects! 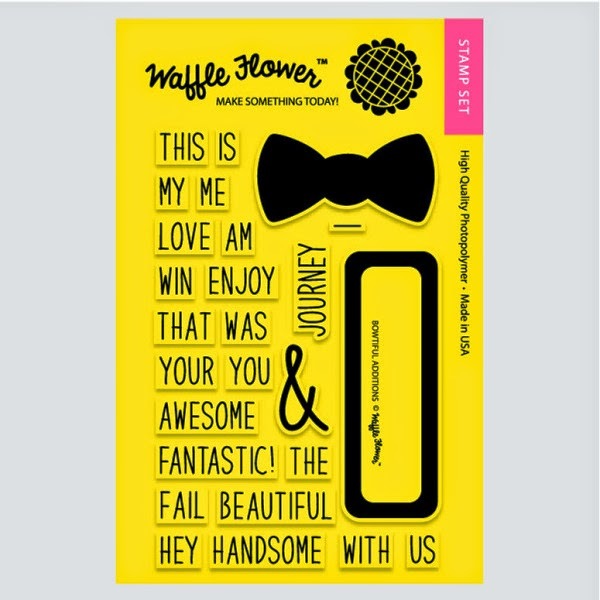 Waffle Flower is a new company that makes high quality polymer stamps. 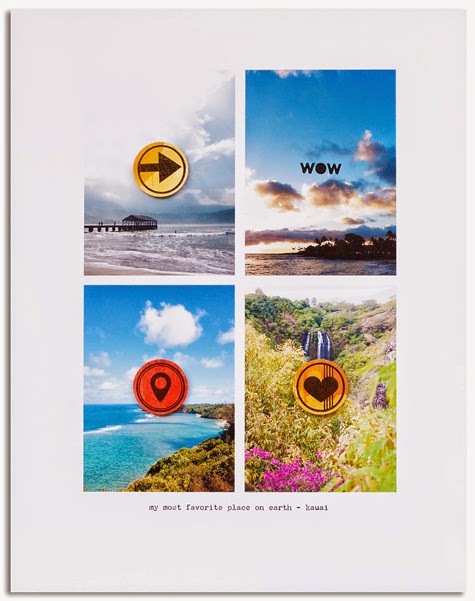 Love seeing a scrapbooking/stamping company find success. Yay for our industry! Plus the owner Nina is a really nice person! Win-win. I got to play with the super popular Bowtiful and the brand new Bowtiful Additions. There are a ton of words in both sets to create cards for just about everyone. 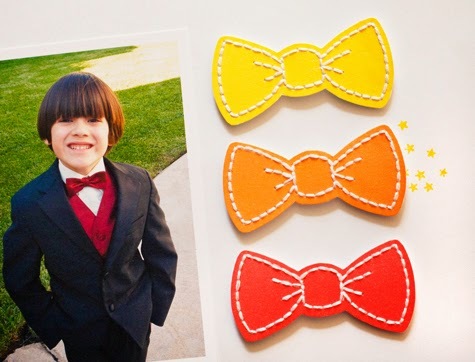 The second I saw the bowties, I knew I'd be using them for this photo of my son wearing his tux. 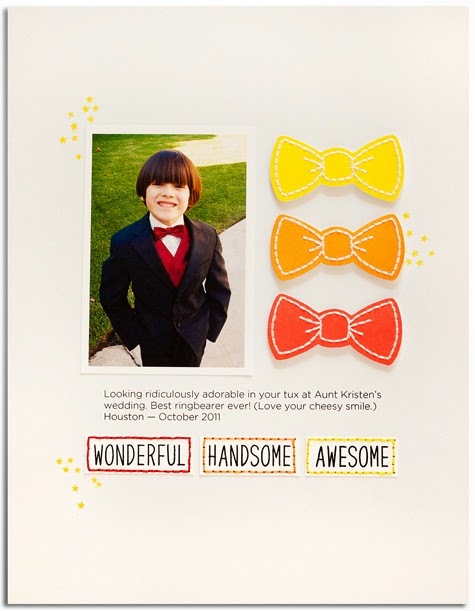 He was in his ringbearer stage a couple of years ago. Look at that faux smile — total cheese ball, right? I stamped the solid bowtie from the Additions in three colors. On top, I stamped the stitched version (original stamp set) with a white ink. Then used the space between the "stitches" to punch holes for my sewing. I did some hand-stitching, and finished off the layout with a sprinkling of the star stamp. Love that stamp! For the card, I used the frame from the Additions set, and stamped a mod pattern using various ink colors. Finished the card off with the Hello from the original set. Clean and easy! Thanks for coming by! 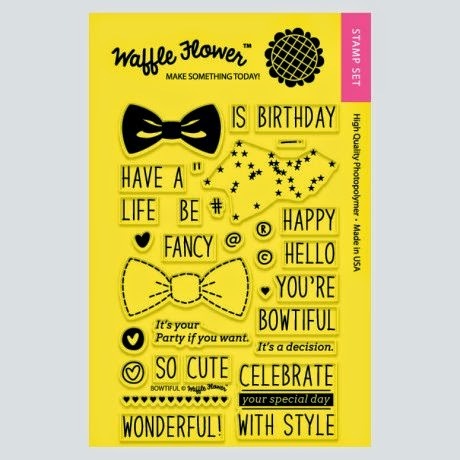 Don't forget to stop by the Waffle Flower blog for lots of ideas and more info on their stamps. Uh, yeah. Blog. I have one. Sorry about that big break. I'm getting ready to travel to Asia with my three kids, and getting that organized has taken most of my free time. That coupled with end of school year stuff. Why are so many things scheduled towards the end? Why am I such a procrastinator? Sigh. Onto more fun stuff. 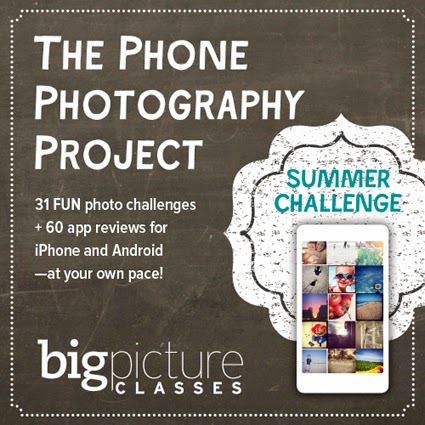 You might remember that last summer, I was one of the teachers at Big Picture Classes' The Phone Photography class. It was such a fun project. But it was live, and there was an assigment every day. Which can get kind of crazy when all you want to do is chill. This time, the class is self-paced! Which means more time to play and no stress. Woohoo to that! What's this class all about? 31 challenges from 31 instructors, and 60 app reviews. We tell you what apps are worth your money, which are not. 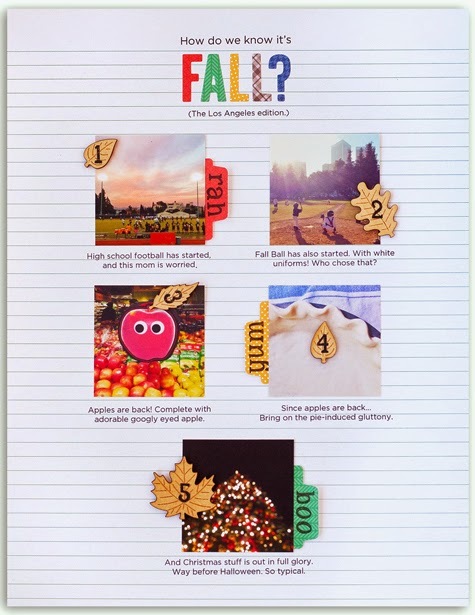 There are also downloadable handouts, tips, etc. And as with all Big Picture classes, you can get access to your class forever. Nice! To find out more and sign up, click here. To follow my adventures in Asia, follow me on Instagram. Be back soon with a few projects that I'm really excited to share! See you then! Hello, everyone! Lawn Fawn is having its monthly Inspiration Week right now. That means lots of ideas and lots of giveaways! 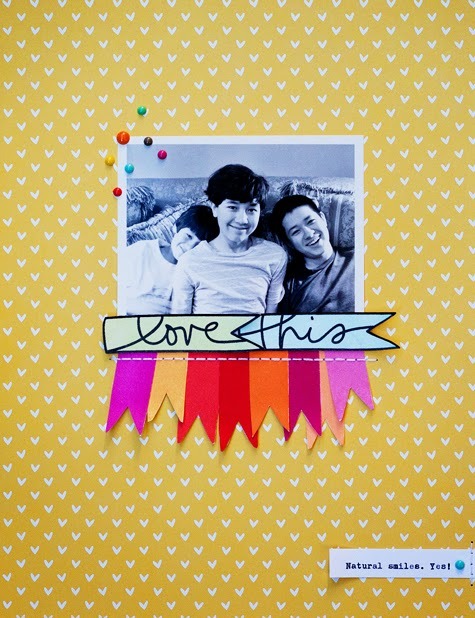 First up, this layout that is all the things I love: simple, clean, white cardstock, bright colors, favorite photo. And rambling journaling. Once cooled off, I dripped some colored mists (Studio Calico) and held the card stock sideways. I love how it added pops of color, but still kept the layout clean and simple. To finish the project, I glued some matching sequins from Lawn Fawn. Super easy, right? There you go. Two totally easy, and fast to create projects. 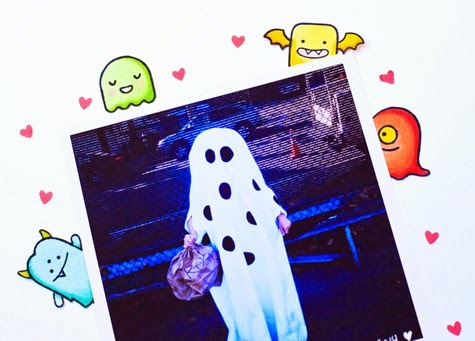 Do go by Lawn Fawn's blog and leave your comments for many chances to win some seriously good loot. Thanks for coming by! Good morning! It's almost Spring Break around these parts, and I'm super duper excited. 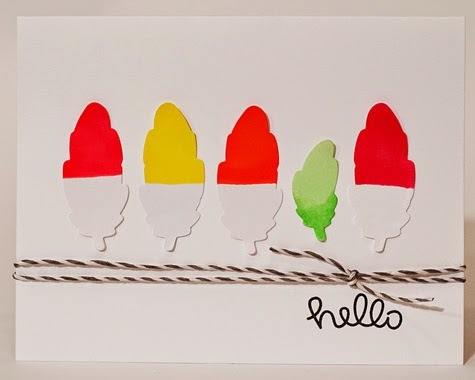 So I made a spring-y, beach-y card for the Lawn Fawn + May Arts blog hop. 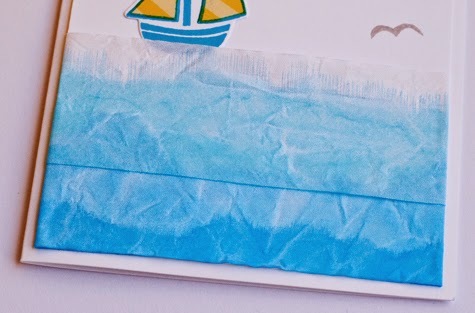 To make the "sea", I used May Arts' 1/5" Silky Crush ribbon in white, and Caran D'Ache Neocolor in Cobalt Blue (I got mine here). 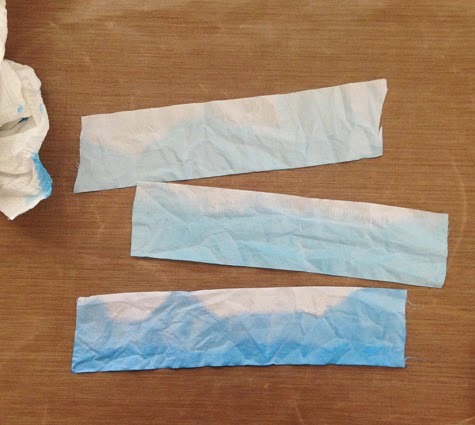 I blended some of the watercolor crayons with water in a container and dipped only the bottom of each ribbon. The water wicks upward and you'll end up with a nice mottled effect. I added a little more watercolor with each subsequent ribbon. To dry them quickly, I used a heat gun. Please be careful because the gun will melt the ribbon if you are not careful. Once dry, the color is a lot more subdued. 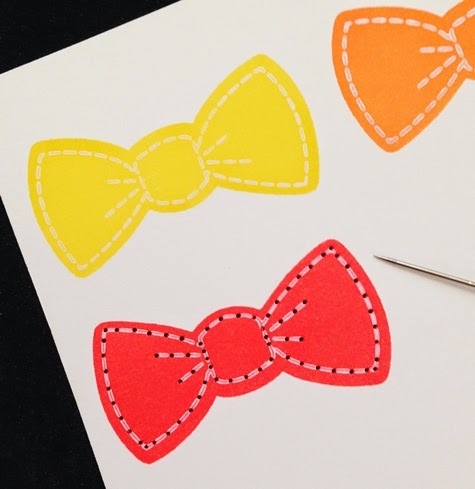 To add more color, re-dip after the ribbon is dry. I ended up using only two of the ribbons, adhered to the card with a dot runner. 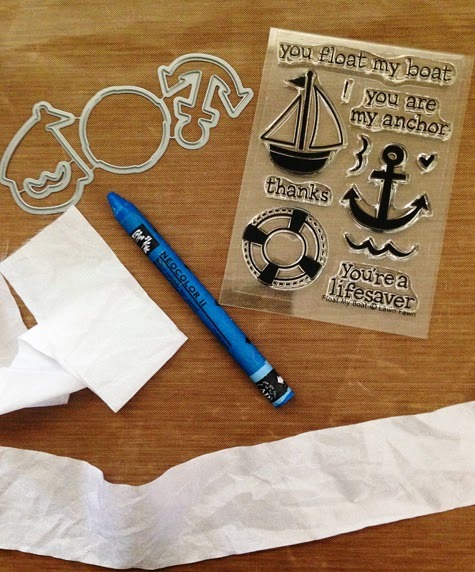 The stamp set I used is called Float My Boat. It has a matching die set. 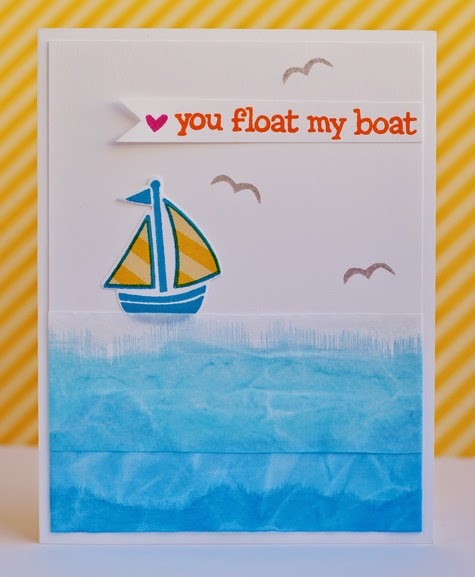 The boat is stamped using Colorbox Pigment in Surf, which turned out to match the watercolor crayon quite perfectly. The sails are from my favorite Lawn Fawn paper line ever, Let's Polka. The sentiment, heart and seagulls are all from the boat set. The inks I used are Colorbox Pigment in Mango Tango, Razzberry, and Wild Hare. Thanks for coming by! Don't forget to visit Lawn Fawn and May Arts blogs and enter to win goodies all week long. Hey there! Happy Thursday! I'm sharing a project for Technique Tuesday, which is also up on their blog. If you haven't been there lately, do go by! It's filled with so many projects and ideas and giveaways! 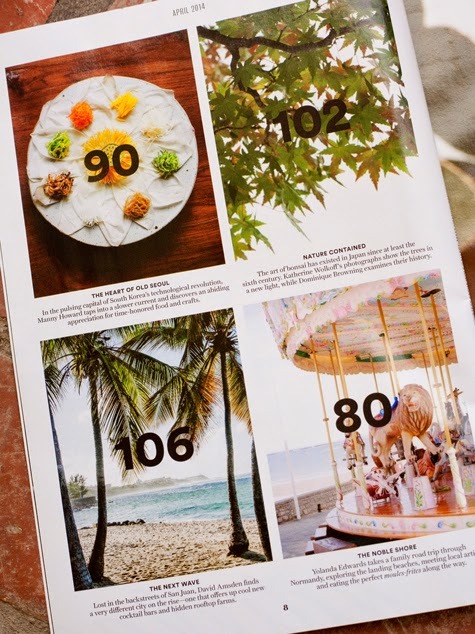 This layout is my ode to dim sum. 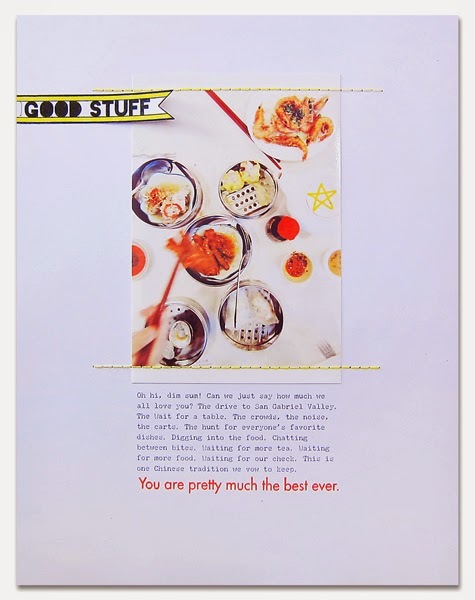 Although I'm quite certain I've made at least another page about dim sum before. How can I not? If you have never experienced it, it's like Chinese tapas. Lots of little dishes shared between friends. The twist is that instead of ordering off the menu, there are ladies walking carts filled with hot, steaming food. You flag them down, they show you what they have, and you choose to take a dish or not. Very interactive. We eat dim sum at least once a month, and my kids love it. Anyway. Layout. Clean and simple. 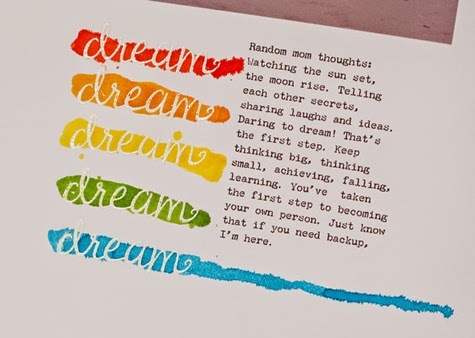 The journaling is printed directly on the cardstock, and the sentiment (I Like You set) stamped directly below it. I adhered and hand stitched the photo right above that. The little flag is made using Weekly Review stamps. I stamped it, colored it a bit, cut off the edges, nipped it on one side, and finished the new edge off with black marker. It was then attached with a tiny stapler. Super easy! Thanks so much for coming by! I hope you have a great weekend. I'm going to spend mine cleaning my work space and going to my kid's baseball games/practices/clinic. It's that season again! Hey there! We are in the middle of Lawn Fawn's March Inspiration Week. 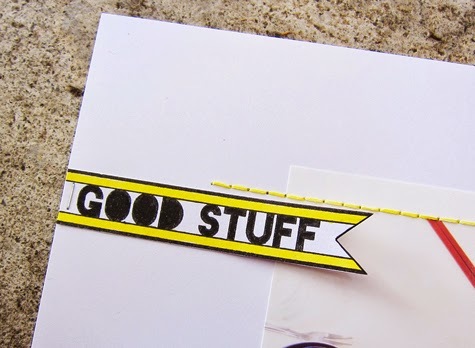 There's so much good stuff: tons of projects and a whole lot of giveaways! Here are my two projects for this week. 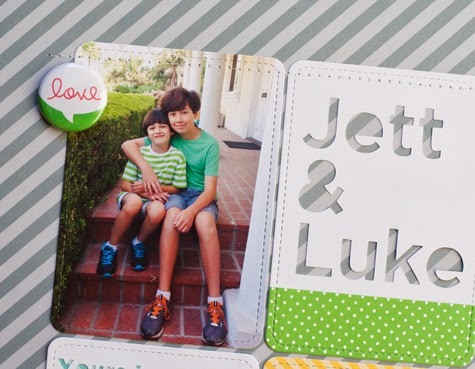 Two layouts featuring the new Let's Polka line. It's not all polka dots, but it's a mixture of dots (big and small), diagonal stripes and hearts. And the dots and hearts were hand-drawn for that whimsical Lawn Fawn touch. The first one is about my middlest and youngest, who tend to fight the most. But I suspect they love each the most too. 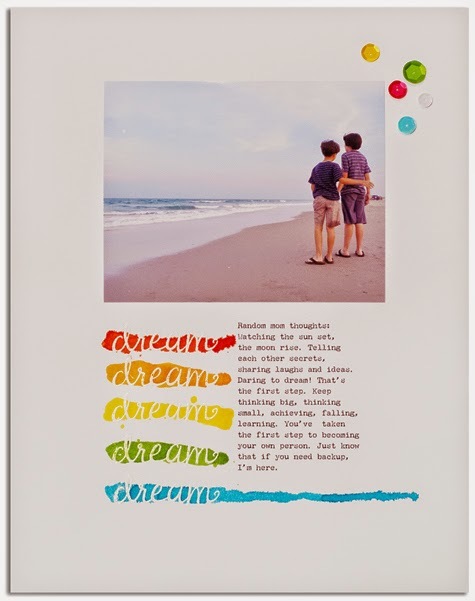 It's a very clean and simple layout that I created by using the Stitched Journaling Card die set from Lawn Fawn. The flair and flower sequins are from the same line. 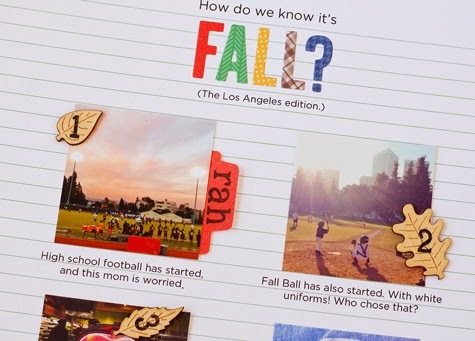 The title and journaling were created with a Silhouette Cameo. I did the Cameo die cutting first. 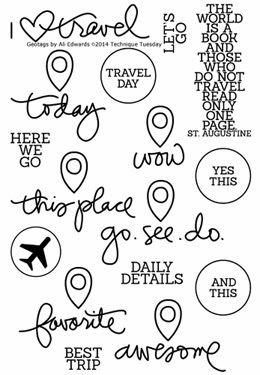 And then I die cut that out with the journaling die. 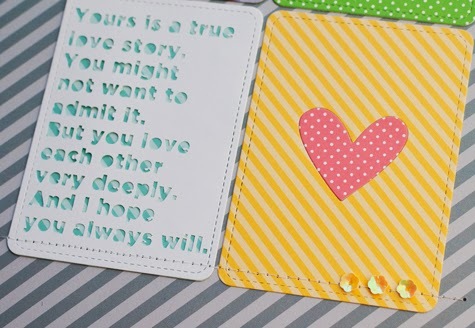 The heart is from Large Stitched Journaling Card set. Some quick machine stitching, and I was done! 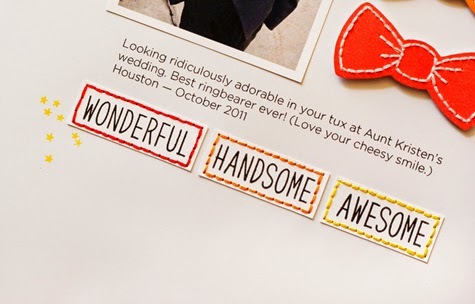 The last one is even simpler with just one photo, some die cutting, a flair, and some gold thread stitching. Quick! But I love how it turned out. 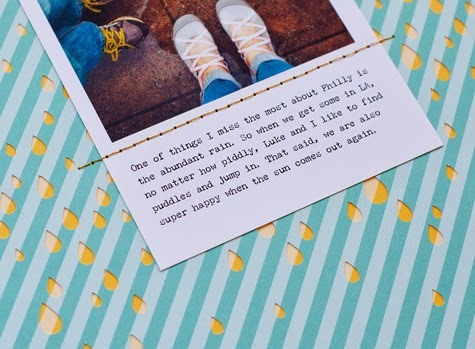 Lawn Fawn has this adorable raindrop die from the Spring Showers set. 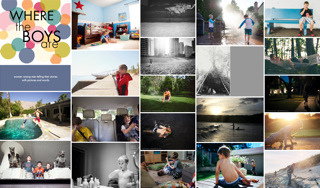 For this layout, I used this freebie. I modified it a bit using the Cameo. 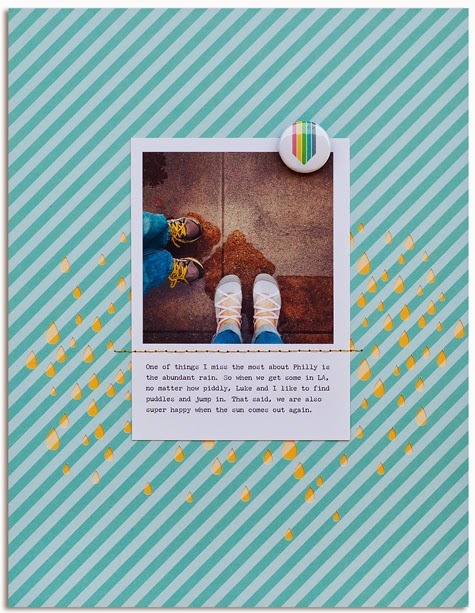 But you can easily use the Spring Shower die with a bigger die cut machine (something wider like a Spellbinder or a Big Shot Pro), or die cut a bunch of raindrops and glued them to your background paper. Thanks for coming by today. Don't forget to go by the Lawn Fawn blog and enter the giveaways! Last week, the Lawn Fawn team did a blog hop with the folks from Timeless Twine. So much good stuff. Who doesn't love twine! And they have such cute color combos. My card is pretty simple. 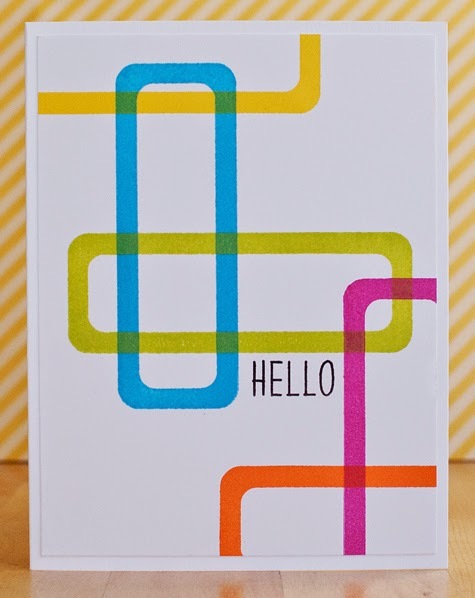 I started by using a pre-printed green polka dot card from Lawn Fawn's new Freshly Cut Notecards. 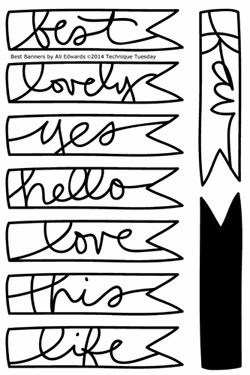 I cut the bottom using the Speech Bubble die (totally ripped this idea off fellow Fawnie Elena - she's super amazing!) I lined the inside of the card with a bit of a striped pink paper from the Let's Polka Petite Paper Pack. The sentiment is from Flying By (one of my favorite all times sets). The adorable bird is from the #awesome set. 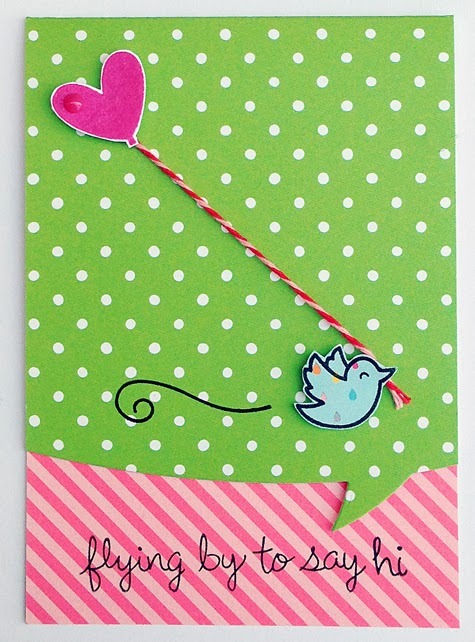 The heart and swirl (behind the bird) are from Hello Sunshine set. Must confess I've used that bird and swirl combo a few times now… Sharing one more usage tomorrow. The bird and the heart ballon are adhered with pop up dots. The cute pink+red twine is tucked behind them. I finished the card with a little epoxy dot on the balloon (My Mind's Eye). And that's the scoop! Oh how time flies. Lots to catch up! For today, I'm sharing a card for Technique Tuesday. As you may know, next Monday is St Patrick's Day. So this week, TT is featuring green projects! 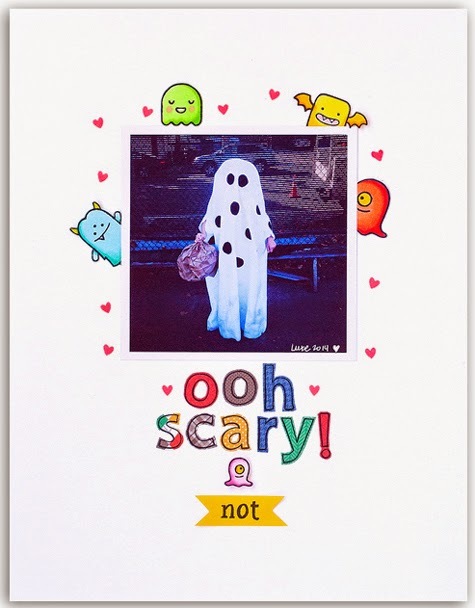 Here's my card, which was inspired by Paige Evans and her awesome layered layouts. Love how she's fearless with pattern paper combos. 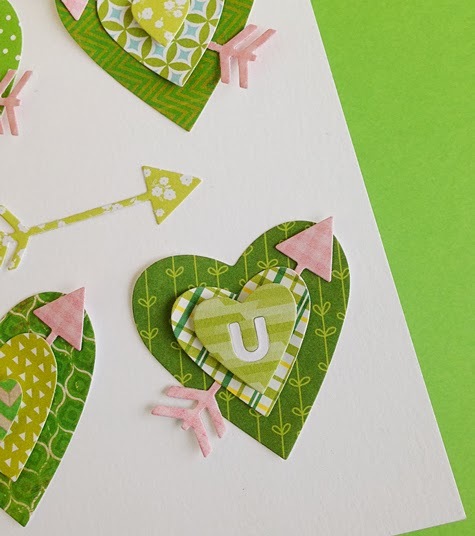 I used the Nested Hearts die set and a bunch of different green patterned papers to cut out the three different size hearts. I didn't think I had that much green stuff, but as it turns out, there was at least one sheet in each mini paper pad I own (I have a lot of those). 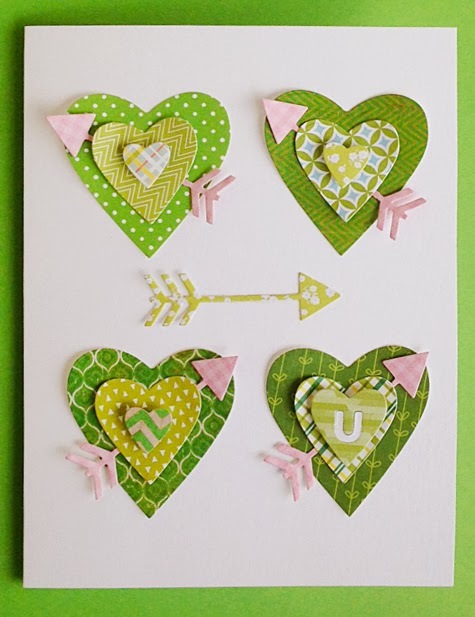 The heart with the U and the arrow are from Heart Card die set. The bottom two hearts are glued together, and the arrow is adhered with a pop-up dot and then the smaller hearts. So easy! Perfect to show someone love on St Patrick's Day. 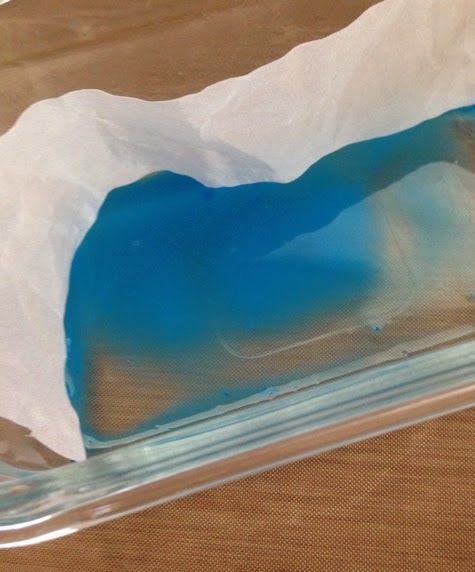 Do visit Technique Tuesday's blog all week for lots more green ideas! Thanks for dropping by today. Super cute, right? I love that it has a solid stamp, so you can add background color to the flags. 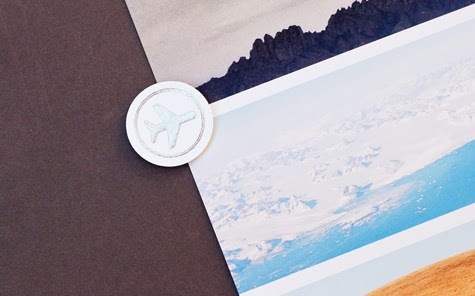 Or, as I did in this layout, I used the solid flag stamp alone to create those little colorful ones below the photo. And of course, there's a prize involved! Technique Tuesday is giving away one $25 Gift Card to Technique Tuesday shop to someone who comments during the hop. To be eligible to win, all you need to do is comment on any of our blog posts! The lucky winner will be announced on the 15th on the Technique Tuesday blog. So leave me a comment here and then off you go blog hopping and commenting some more! Thanks for coming by! Hey there! Belated Happy New Year! We spent the two weeks the kids had off in Texas, hanging out with family. I didn't take lots of photos, didn't go anywhere, didn't do much. We just spent time hanging out (and eating) with family and old friends, and it was the best. Then we came back. And then school and work restarted. And here we are: CHA time! 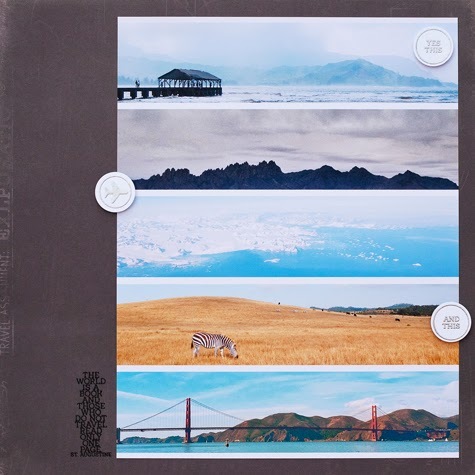 This is a layout I created for Technique Tuesday using a new set from Ali Edwards called Geotags. 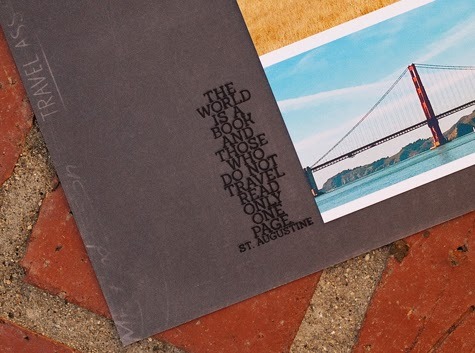 Geotags have been really popular for a while now, and this set combines that with Ali's famous handwriting and some great circle tags. The circles can be cut using an 1" punch. I made this layout by printing all the photos on one sheet of photo paper. Then rest was super easy. I stamped the circles on white card stock, and embossed them with silver embossing powder. Then I adhered them to the page with pop up dots. I finished by stamping the sentiment (also from the set) with black ink. I really like how it turned out. It's simple, it's clean, it's me. Please go by Technique Tuesday and see all the new releases! There's so much new stuff. So good! Thanks for dropping by! If you are going to CHA, come see me in the Lawn Fawn booth (booth #2742).